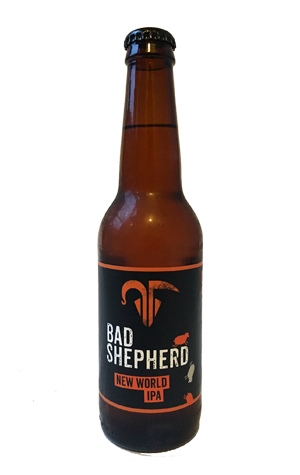 The new releases keep on rolling out of Bad Shepherd's Cheltenham brewpub, with this one set to become part of the core range too. It gives the Tiny IPA and American Pale already on the roster a big brother to look up to: a 6.8 percent ABV New World IPA that plucks its hops from near and far. There's Aussies Vic Secret and Ella, Americans Columbus and Simcoe, Kiwi Moutere (formerly Brooklyn) and new French variety Barbe Rouge too. And those who know something about hops will know there's a few varieties in there that pack a serious punch. Indeed, if you know the Bad Shepherd range, you'll have tried their raved about Hazelnut Brown and that's a good starting point here: the lusciousness of that beer is matched by the bitter bite of this one in terms of impact. Aroma wise, it's hops of a dank, piney and bitter citrus peel persuasion that dominate, with a little soft berry bringing up the rear. On the palate, they're more woody and resinous, packing real punch for those who like the IPAs US-inspired and with the reins off.